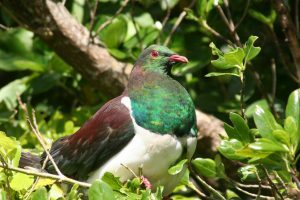 It’s been a huge couple of weeks in New Zealand conservation, with Conservation Week, followed by the Great Kererū count and today voting opens for Bird of the Year. I find Bird of the Year fascinating, both because I am a giant bird-nerd, but also because I have a professional interest in what people like about the natural world. My research looks at non-human charisma, that mysterious “it-factor” that makes us like a particular creature or plant more than another. And, I want to know whether non-human charisma is involved in conservation in New Zealand. I’m also keen to define what humans find charismatic, because although it’s a word that we frequently throw around, there is no clear definition of what charisma means in humans, let alone what it means when we use it to talk about nature. Thankfully, and somewhat to my surprise, the academic literature actually has a lot to say about charisma. So here are some thoughts and predictions about which bird the research shows might win Bird of the Year. And, klaxon warning, the following are all generalisations. Just because the data show that most people like a particular thing, there is no reason that you should agree. People vary! You can roughly divide charisma into the characteristics that are part of the bird’s body, and the traits that we humans bestow onto the birds. The word “charismatic” in the animal world is so often attached to the term “megafauna”. And, much as we do like the galumphingly oversized, we also find the tiny animals cute. The rule is, I think, that a critter has size charisma either if it’s endearingly huge or if it is cutely undersized compared to the size that we think it’s meant to be. Our oversized contenders, therefore, include albatross and kererū and kākāpō, all of which are larger than the average seabird/forest bird/parrot (delete as appropriate). Contenders for the tiny-prize include the New Zealand robin and Chatham Island black robin, the little penguin and the rock wren. NZ’s tiniest bird, however, is the rifleman which is about 8cm tall and weighs the same as a 10-cent coin. The research shows that humans are attracted to creatures that have warm colours like reds, oranges and yellows. And there are a lot of birds that have these. Black fronted terns, fairy terns and shore plovers all have distinctively bright beaks, kakī (black stilts) have bright legs and both pukeko and takahē have a vivid red beak and leg combo. There are birds with bright tummies (kōtare and miromiro) and a special mention must be made for the tīeke’s bright red wattles. But the winner, by a mile because of being basically all yellow, has got to be the mohua. 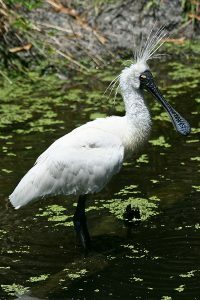 A Royal Spoonbill in Australia, John O’Neill, Wikimedia Commons CC BY-SA 3.0. Birds that have ornaments stand out from the crowd. You can’t miss the jaunty, bright blue, wattles of the kōkako, the comedy “eyebrows” sported by both rockhopper and Fiordland crested penguins and that wee white ruff of feathers that the tūī have at their necks. There is also the unique sideways bent beak of the wrybill and the nostrils at the end of kiwi beaks. The winner of ornament competition has to be the royal spoonbill, who combine a cutlery-shaped beak with a mad crest of bright white feathers that stick up in the slightest breeze. A personality is the spin that we give to the actions of birds around us. We call kea “cheeky”, weka are wicked, kiwi, and many nocturnal birds, are shy, and pīwakawaka are playful. The idea of birds having personalities is problematic, however, because only animals that we know get to have personalities. If we’ve never encountered a critter, either in person or through the media, we can’t give it a character. The winner of the personality stakes must be the kākāpō and not the whole population of kākāpō either. Sirocco, he of head shagging fame, serves as a proxy for all kākāpō personalities as loud, brash, sexually over-confident birds. If the rest of the kākāpō population are embarrassed by his actions, they are staying tactfully silent on the subject. 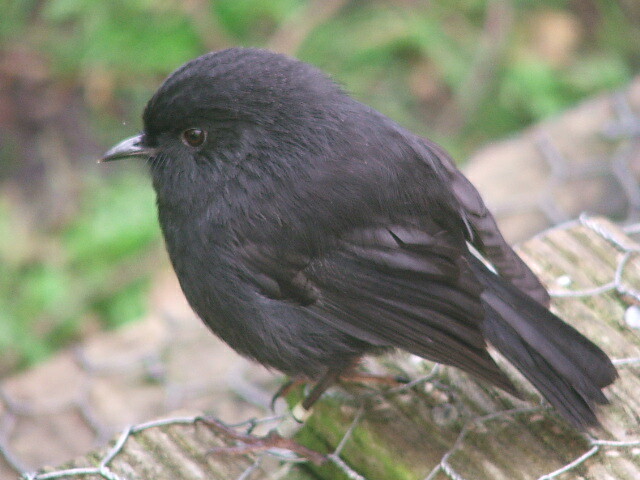 Chatham Island black robin. Flickr CC, schmechf. An awful lot of the Bird of the Year contenders are classed as “in serious trouble”. But you have to be a certified bird nerd to know this without looking it up. Most of us know, because we’ve all read the children’s book, is that the Chatham Island black robins were once the rarest birds in the world. What fewer of us know is that New Zealand’s rarest bird is, currently, the fairy tern (tara iti) with only ten breeding pairs left, so they, sadly, win the rarity competition. The wild card, that my research can’t take into account, is the person who is running the campaign for each of the contestant bird. If the campaign manager is trusted, connected and has a positive public profile (like Sir David), this makes us like, and maybe vote for, the bird. This can change yearly and, I suspect, may be the most influential reason that we vote for a particular bird. If you’re wondering who I’m voting for, I’m a lifetime member of team shore plover (pictured above). And, they tick many of the charisma boxes. They are amusingly small shorebirds, with a bright orange beak and a coronet of white feathers that makes it look like they are wearing a tennis sweatband. They are busy, noisy wee birds who are seriously rare, but don’t seem to know it. You have until 5pm on Sunday, October 14th to vote for your favourite bird. And please do. It’s our chance to turn the spotlight onto some very beautiful creatures, some of which only live here. I think one crucial factor is familiarity. Seabirds and shorebirds always make the bottom of the list of the Bird of the Year, despite ticking most of the boxes you mentioned (and constituting most of our avian diversity). I’ve got the data from the last two competitions if you’re interested in looking at it. I’d be so interested Yvan. There are a tonne of other things that the charisma literature turns up including whether or not we “share an ecosystem” with the critter involved. Maybe that’s one of the problems for sea birds?